Winning technology for vacuum infused composites. Vactac hot melt spray adhesives have been specially formulated for use with vacuum infused composites, to position and secure reinforcement materials during lay-up. They are applied to one surface only using our vactac spray tools, where, for up to 5 minutes, they provide an instant, very high ‘grab’ adhesive surface. Once attached, the reinforcement materials can still be easily repositioned if required – only once they have been firmly pushed together is the final adhesive bond made. An additional benefit when using vactac adhesives is that there is no waste. Any unused adhesive left in the tool at the end of the job simply re-melts when the tool is next switched on and can continue to be used in the normal way. 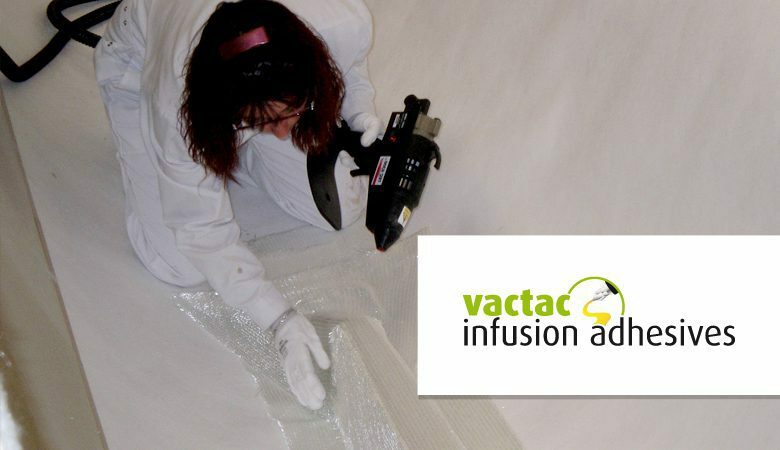 Unlike VOC (volatile organic compound) spray adhesives, vactac has an indefinite shelf life and does not require any special packaging, transportation, or storage. Vactac also has none of the health and contamination problems normally associated with airborne particles from these other adhesives. Our unique vactac adhesives are solvent and water-free.